With the Gold Market at an all time high, now is the time to gather up that old Gold Jewelry sitting on your dresser and turn it into cash. 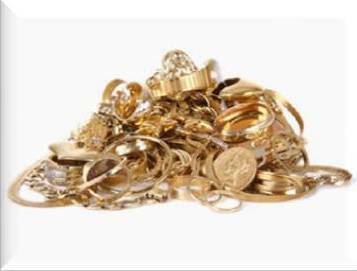 Whether you have broken chains, old rings, or just items you no longer wear, send them in for an evaluation and price quote. Integrity Gold typically pays approximately 20-30% more than most jewelers. We remove all substantial stones and return them with your check. Act now while the market is high!!!! I sold some old gold jewelry through Dave. He gave me a great price; way more than I would have received if I had sent it into one of those tv or newspaper solicitors. Dave at Integrity Gold is an honest businessman who makes it easy. Dave Gangel is my jeweler! I wanted to thank you for your great service recently when I decided to sell some of my gold jewelry. I wanted to shop around for the best price, and went to three different stores for pricing. All three were in the same range, and the last one told me he would pay me $30 more than anyone else. The first location was a local Jewelry Center that advertises new and estate jewelry. That saleswoman was fantastic in that she took the time to explain to me how they evaluate the jewelry and what to look for when buying jewelry. She did tell me that I would be able to get more for my jewelry someplace else, as they were only a middle-man. That was very nice of her. When I discovered you were a jeweler and that you also buy gold, I knew you were the one for me. You took the gold to your store, weighed it, and called me with the great news that your price was 50% more than anyone else! I will definitely tell all my friends about your level of CUSTOMER SERVICE and INTEGRITY! There will be no other jeweler in my life from now on...you have a customer for life!